Fly to Winnipeg where you will check-into the Four Points Sheraton. At 7:00pm a dinner will be held at the hotel where you will meet your group and your adventure specialist. Have an early night as it will be an early start to the next morning. 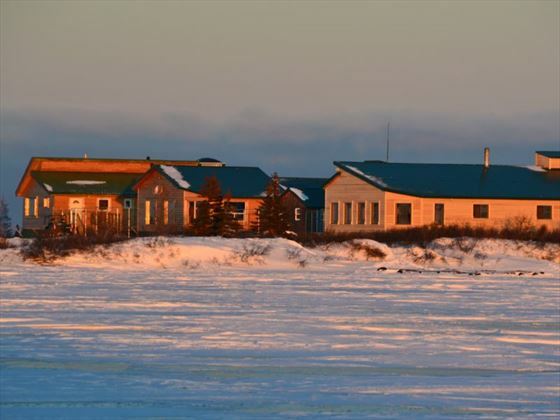 Arrive in Churchill by air where you will be met at the airport and provided with instructions of the morning transfers. You'll also pick up the winter gear you'll be renting. You will then be transferred by fixed wing aircraft to Dymond Lake Lodge. 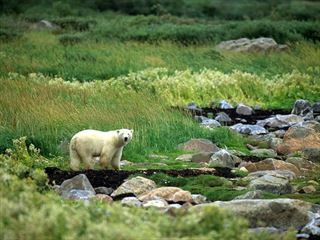 This exciting flight takes you out over the historic Churchill River, and then northwest up the rugged Hudson Bay coast to Canada’s most exclusive Polar Bear viewing properties. 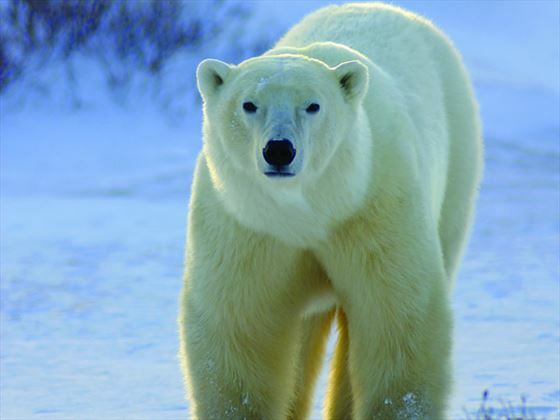 Keep a sharp eye out en route for possible sightings of caribou, moose, seals, wolves and of course the "Great Ice Bears". 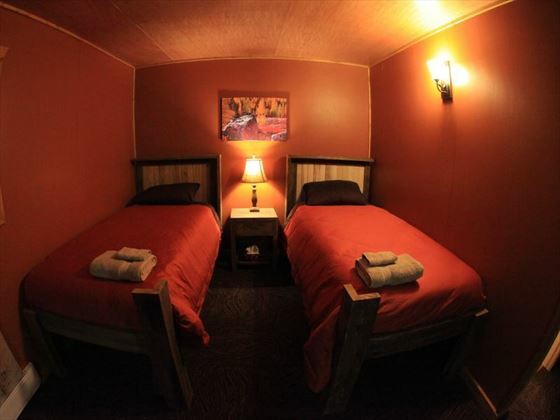 Upon your arrival, your hosts will provide a tour of the Lodge and get you settled into your room. 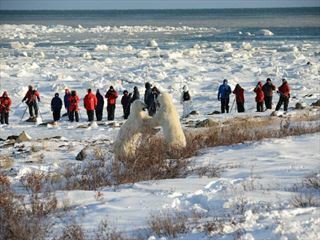 A thorough orientation on travel in polar bear country will be provided prior to any outings. 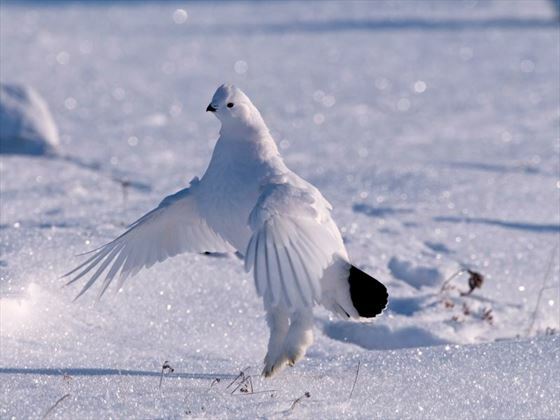 This day includes a guided hike on our rugged and starkly beautiful coastline, an interpretive slide show featuring the wildlife of Hudson Bay, and hopefully a clear night for viewing the Aurora Borealis. 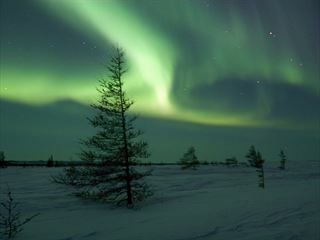 Dymond Lake Lodge features a heated Aurora viewing tower for northern lights observation. 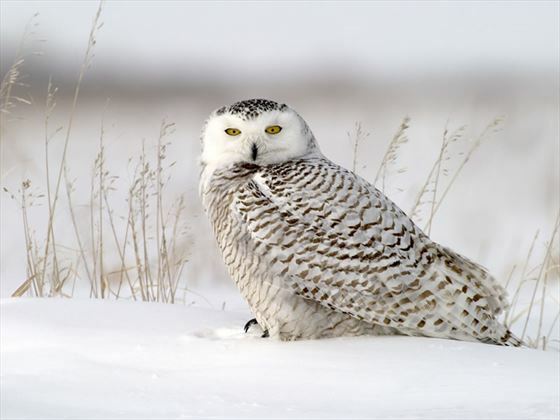 All this will be topped off with a lunch and dinner where your hosts and guides will regale you with tales of life and adventures in Canada’s Arctic. 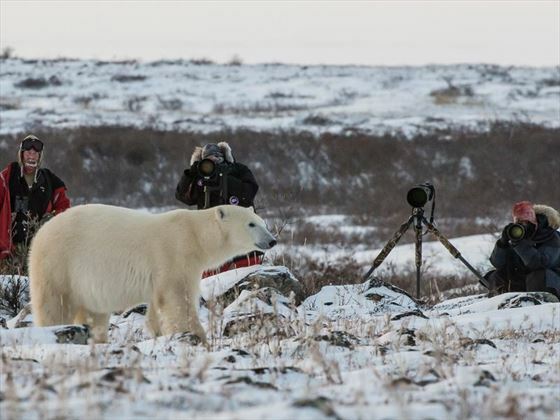 In the coming days, your breakfast will be served at 8:00 a.m. and the first walking tour generally leaves at 9:30 a.m. Should there be a polar bear in camp (this happens frequently! ), the walking tour is delayed for picture taking but no one ever seems to mind! The walks are comfortably paced as they are geared towards plenty of viewing and photo opportunities. They are guided by our professional and knowledgeable specialist bear guides, so you’ll do a lot of learning along the way as well. 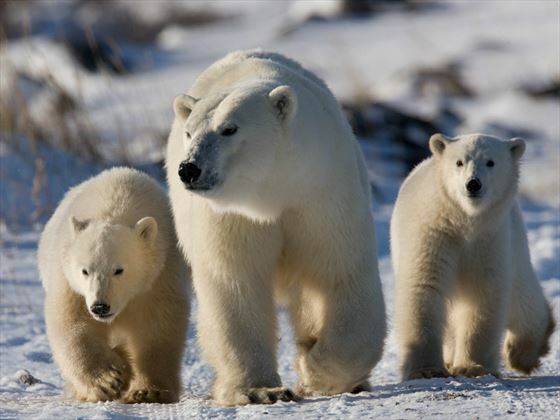 Your guides are expert in keeping bears at a safe distance without sacrificing exciting viewing. 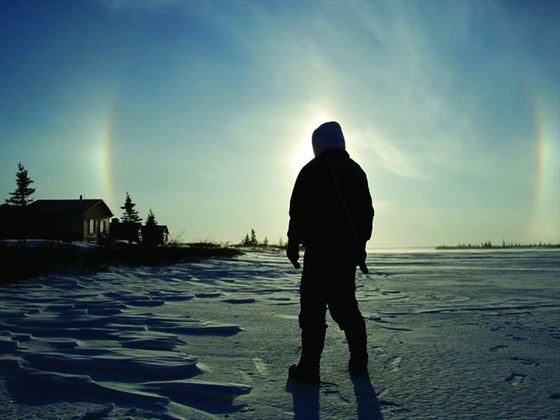 Dymond Lake Eco Lodge is the only remote Lodge in the world where you can experience the spectacular wild of the Boreal forest, remote tundra, and the arctic sea ice all in the same day! Lunches will be enjoyed at the lodge with some relaxation time to follow. You will head back out around 2:30pm and return to the lodge by 4:00 p.m for hot or cold drinks and appetizers. Your full course dinners are served at 7:00 p.m. after which, the fireplace is almost always central. Your guide team will give informative lectures and beautiful slide presentations as well as initiate a discussion about the activities for the following day. Bedtime is at your leisure. 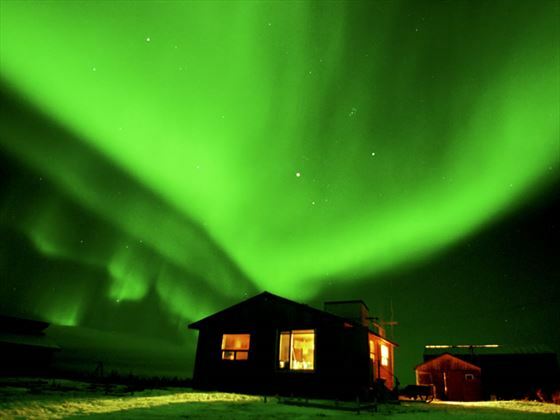 The entire Lodge area is patrolled for polar bears all night by onight watchmen so be prepared to have your sleep cut short by a nocturnal visit by one of the great Ice Bears (or by one of our dazzling displays of northern lights!). After another hearty breakfast and it is time to pack for the flight back to Churchill, say goodbyes and snap a few more pictures. After another exciting aerial tour, you’ll arrive in Churchill where your bags will be stored for you until you can check into your hotel later in the day. You are then free to explore and wine & dine in this frontier community at your leisure. 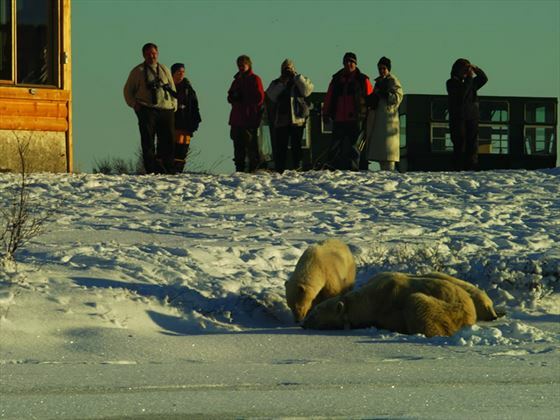 We recommend local places such as Cape Merry, the Port of Churchill, the Eskimo Museum, as well as the Parks Canada exhibit are all of great interest. Dog sledding and helicopter charters fit nicely into this afternoon if you’re so inclined. You will be provided with a $30.00 dinner voucher for tonight. The participating restaurants will be outlined on the voucher. Then it will be back to your hotel or B&B so you can rest up for your 6th and final day with the bears. 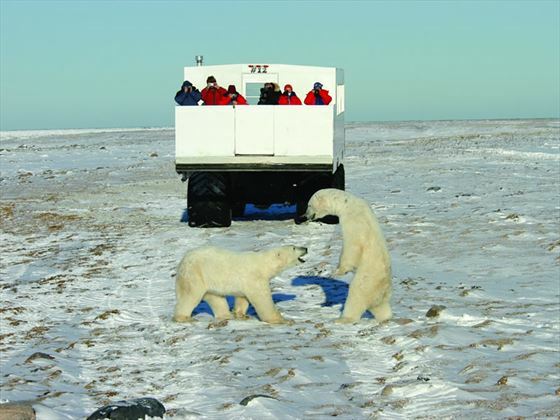 Today you will travel across the tundra in the world famous Tundra Buggies ® for more polar bear viewing. Transportation by bus to and from the Tundra Buggies ® is provided at 8:00 a.m. and 5:00 p.m. respectively so do remember to grab some breakfast beforehand. Lunch "with the bears" will be prepared and served to you on the tour. Your flight south to Winnipeg is scheduled for this evening. You will check into the Four Points Sheraton upon your return to Winnipeg. Overnight Winnipeg.